Shiatsu can be gentle or quite physical. This can mean it can be succesful at relieving neck tension & also helping with neck injuries & complaints. A lot of us hold the tensions & stresses of our lives in our shoulders & neck. Shiatsu massage is given on a futon style mat on the floor & this allows satisfying & tension-releasing stretches. If a gentle or quiet treatment is required the neck can be worked from the sacrum & spine. If you are interested in finding out more then do getnin touch through the ‘contact me’ page. I am always happy to talk Shiatsu. I have had a number of clients come to me with knee issues. Sometimes they have been alongside other issues with hips, lower back or ankles & sometimes they have been a stand alone issue. Shiatsu can be really helpful for knee & other joint conditions. The injury can be well supported & it can be worked on directly or from a distance. Shiatsu massage can help without working directly on an injury, which is very useful,if the area is inflamed or tender to the touch. Shiatsu can be used to help move energy through an injury, bringing healing to the area. It is also possible to work an injury from a completely different part of the body, treating the whole body but also focusing on the client’s concern. When appropriate the knee can be moved & worked on directly. There are a number of Shiatsu points in around the knee area that can be very successful in helping a knee injury to heal. I have had good results when working on knee complaints. Clients have experienced a relief from the pain or discomfort, swelling has gone down & flexibily has increased. If you are interested in finding out more do get in touch through the ‘contact me’ page. Easter will be on us before we know it now. 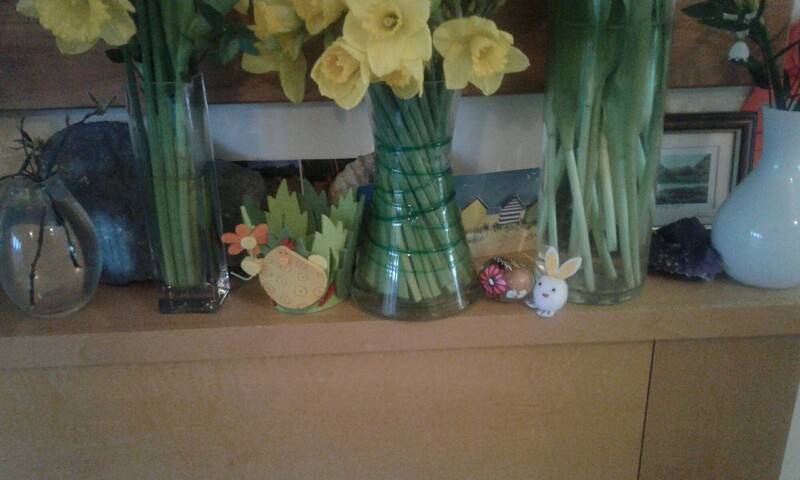 I found these Easter dudes in a charity shop today & decided I didn’t need to put them away for a week so they joined all the flowers I received for Mother’s Day on our mantel piece. It has been a tough school term for us, our first year of school & we are still building the stamina it takes for the whole family to make it through each term! I have decided to take a week’s holiday on the week running up to the Easter weekend. So no Shiatsu week commencing 10th April & back Tuesday 18th April. We are going to spend the week visiting family. So although I am not offering Shiatsu here in Exeter one of my family members will probably ask for a quick treatment – it’s so often the case. We are so well supported by our families it’s actually the least I can do. If you would like to know more about Shiatsu or would like to book a massage before I go on holiday then get in touch through the contact me page. A lot of people really want to have a Shiatsu massage but struggle to find the time to book one. It’s such a busy work/ life culture that we live in. We spend so much of our time at work, doing often demanding & challenging jobs. The rest of the time we seem to be rushing to get everything done & trying to enjoy ourselves & our loved ones. A lot of my Shiatsu massage appointments are in the day on week days but I do offer an early evening appointment on a Wednesday & also morning appointments on a Saturday. The Saturday appointments are early enough so it’s possible to still make the most of the day but not to early that you have to get up before you’re ready! The clients I see on Saturday’s have often looked forward to their Shiatsu through the week & feel its a real treat at the end of a busy week & a great way to start the weekend off. My practice room is quiet & calm & is in Exwick, on the north west side of Exeter. Its easy to get to. There is ample parking & it is walking distance from the railway station & it’s on a bus route. Have a look at my pages on this site, for more information about Shiatsu massage or me. There are also photos of what to expect. Please get in touch through the contact me page with any questions. As Shiatsu is generally given on a futon mat on the floor it is possible to give really satisfying stretches, when appropriate. Shiatsu massage can be given in a seated position when lying is not comfortable but often clients will comment on how satisfying the stretches in their massage were. The body holds all our tensions & stresses & it is possible to release this by doing yoga or stretching but there is something different when someone does the stretch for you. It can feel sore, in a good way & it can get the energy moving around the body more freely. If you are interested in knowing more then do get in touch through the ‘contact me’ page. I have a Facebook page that you may also like to look at. I work in Exwick, Exeter, Devon. I have a calm & peaceful Shiatsu practice room. I work Tuesdays, Wednesdays & Saturdays. Well it’s been a special day today, the weather has been warm & sunny & we have celebrated Mother’s Day with my mum. This might not seem like anything out of the ordinary but this is the first year without my granny. She died last summer & although she was missed at Christmas it felt especially obvious that she is no longer around today. Granny somewhat dominated Mother’s Day, she insisted on presents & her two daughters spending the day with her. 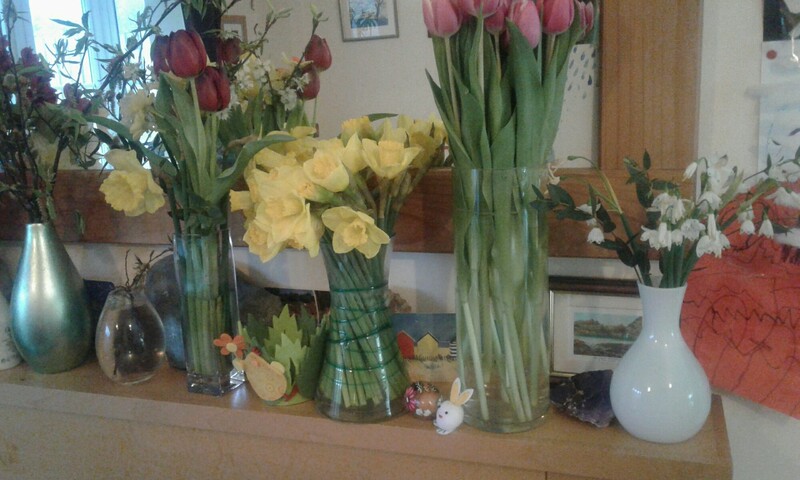 This is understandable but did mean my mum & aunty struggled to spend time with their own children on Mothering Sunday. So today I made a pastry pie, my mum’s favourite & we spoilt her. My aunty also enjoyed a day with her children. We toasted granny & mothers & carers the we know or have known. It was important to us to remember the line of women we have each come from & also to acknowledge that you don’t have to be a mother or even a woman to hold the role of ‘mother.’ We had a moment of quietness to remember those people who weren’t with us, mother’s or whoever. Mum was so happy basking in the warmth of the family, my sons love her & it’s so lovely to watch their relationship. Later in the afternoon I gave mum a short Shiatsu massage. This is such a special thing to be able to do for her. She loves it & I know it is not only nurturing but relaxing as well. A moment where I can support her. All in all a lovely day. I am so lucky to have a supportive & understanding mum & to be able to do just a little for her, pie & Shiatsu, meant a lot. I have a Facebook page that you maybe interested in liking. I have events & offers that I advertise there. If you want to get in touch then please do through the ‘contact me’ page. I am always happy to talk Shiatsu. I work in Exwick, Exeter, Devon in a lovely calm & quiet practice room. Just a reminder that I have this event coming up. I will be there Saturday & Sunday giving Shiatsu massage tasters for just £15. You can book aShiatsumin advance. Go to the event page, find me & click on the booking link. If you have any questions do get in touch through the ‘contact me’ page.